Credit: Dr. Aline Koch, Justus Liebig University Giessen, using a LEICA TCS SP8 confocal microscope. 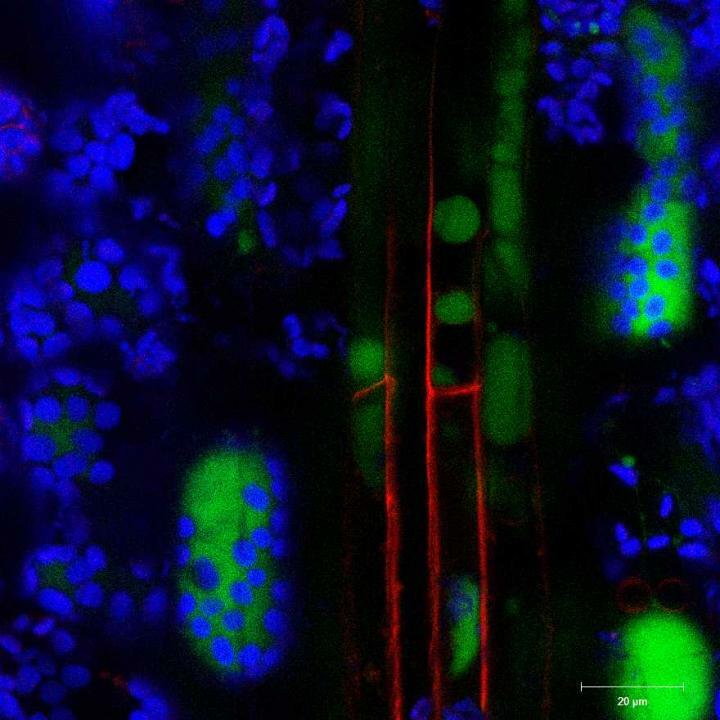 Spraying barley crops with RNA molecules that inhibit fungus growth could help protect the plants against disease, according to a new study published in PLOS Pathogens. Plant diseases caused by fungi that grow on crops seriously threaten the world's food supply, and fungi can develop resistance to traditional pesticides. To improve the antifungal arsenal, Aline Koch of Justus Liebig University, Germany, and colleagues are investigating RNA-based techniques that fight fungi at the genetic level. In the new study, Koch's team sprayed a double-stranded RNA molecule called CYP3-dsRNA onto barley leaves and exposed the plants to a common disease-causing fungus known as F. graminearum. When absorbed by fungal cells, CYP3-dsRNA is known to target and silence the expression of three key F. graminearum genes, inhibiting the pathogen's growth. The scientists found that CYP3-dsRNA inhibited fungus growth on sprayed plants but not on unsprayed plants. The researchers also found reduced F. graminearum growth on leaves that were not directly sprayed with CYP3-dsRNA, suggesting that the plant's vascular system can transport the RNA from sprayed leaves to distant infection sites. Further experiments demonstrated that a fungal protein known as DICER-LIKE 1 is important for CYP3-dsRNA to inhibit growth effectively. These findings will help inform future research into RNA-based control of plant pathogens. Koch's team had previously shown that barley plants can be genetically modified to produce CYP3-dsRNA themselves. However, scientific and societal obstacles to genetic engineering pose challenges for this technique. Spraying RNA directly onto crops could be a more viable, sustainable, and environmentally friendly alternative. "The discovery that spraying of small RNAs targeting essential genes of the fungus Fungus graminearum," the authors report, "reduced its plant infection adverts to a new generation of environmentally-friendly fungicides." Please contact [email protected] if you would like more information. Funding: This work was supported by the German Research Council (Deutsche Forschungsgemeinschaft, DFG) KO1208/23-1 and was supported by grants from the LOEWE program Medical RNomics (State of Hessen; to OR). The funders had no role in study design, data collection and analysis, decision to publish, or preparation of the manuscript. Competing Interests: I have read the journal's policy and the fact that the authors VC, JM, and TM are employed by a commercial company BASF Resesarch Triangle Park and BASF Limburgerhof does not alter our adherence to all PLOS Pathogens policies on sharing data and materials. Antarctica is practically defined by ice. What happens when it melts?